Learn all the Java and Android skills you need to start making powerful mobile applicationsAbout This BookKick-start your Android programming career, or just have fun publishing apps to the Google Play marketplaceA first-principles introduction to Java, via Android, which means you'll be able to start building your own applications from scratchLearn by example and build three real-world apps and over 40 mini apps throughout the bookWho This Book Is ForAre you trying to start a career in programming, but haven't found the right way in? Do you have a great idea for an app, but don't know how to make it a reality? Or maybe you're just frustrated that “to learn Android, you must know java.” If so, Android Programming for Beginners is for you. You don't need any programming experience to follow along with this book, just a computer and a sense of adventure.What You Will LearnMaster the fundamentals of coding Java for AndroidInstall and set up your Android development environmentBuild functional user interfaces with the Android Studio visual designerAdd user interaction, data captures, sound, and animation to your appsManage your apps' data using the built-in Android SQLite databaseFind out about the design patterns used by professionals to make top-grade applicationsBuild, deploy, and publish real Android applications to the Google Play marketplaceIn DetailAndroid is the most popular OS in the world. There are millions of devices accessing tens of thousands of applications. It is many people's entry point into the world of technology; it is an operating system for everyone. 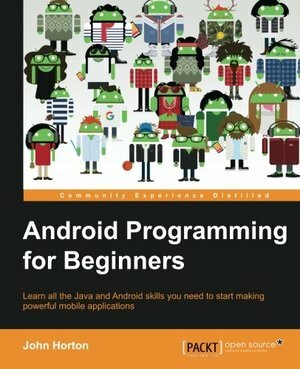 Despite this, the entry-fee to actually make Android applications is usually a computer science degree, or five years' worth of Java experience.Android Programming for Beginners will be your companion to create Android applications from scratch―whether you're looking to start your programming career, make an application for work, be reintroduced to mobile development, or are just looking to program for fun. We will introduce you to all the fundamental concepts of programming in an Android context, from the Java basics to working with the Android API. All examples are created from within Android Studio, the official Android development environment that helps supercharge your application development process.After this crash-course, we'll dive deeper into Android programming and you'll learn how to create applications with a professional-standard UI through fragments, make location-aware apps with Google Maps integration, and store your user's data with SQLite. In addition, you'll see how to make your apps multilingual, capture images from a device's camera, and work with graphics, sound, and animations too.By the end of this book, you'll be ready to start building your own custom applications in Android and Java.Style and approachWith more than 40 mini apps to code and run, Android Programming for Beginners is a hands-on guide to learning Android and Java. Each example application demonstrates a different aspect of Android programming. Alongside these mini apps, we push your abilities by building three larger applications to demonstrate Android application development in context.